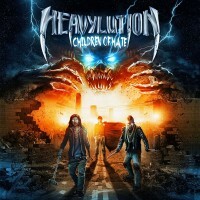 HEAVYLUTION is a French Heavy / Power Metal band that was formed back in 2005 (at least, according to Metal-Archives.com; the band’s website states 2007). With their third release and debut full-length, they thus celebrate their tenth anniversary. It started with the “Metal Is Our Blood” demo in 2009, followed by the “The Architect” EP in 2011. Now, since February 2015, the first album is out under the title “Children Of Hate”. Looking at the cover, I couldn’t help but think of IRON MAIDEN (“Brave New World”, for example) or GAMMA RAY, who also have their monstrous mascot. The album itself contains eleven tracks, including an intro. It all begins with that intro, “The Call”. A guitar lead as basis, while slowly the power of Metal is added. The epic intro connects with “Children Of Hate”, which kicks off instantly. The fast kickdrums stand out in the rather slow verses. Leads are key in this band’s songs, without a doubt. As the speed increases, the influences from IRON MAIDEN and perhaps even STORMWARRIOR are crystal clear. And I must add that, in one way or another, Paul’s voice sounds somewhat similar to Bruce Dickinson’s. The slower chorus is quite simple, just look at the title. As said before, leads are important, but so are solos and for that the band invested a lot of effort. All the while, the rhythmic backing is submit to various changes. So far, a job well done. “Obsession” is about shredding, at least in the beginning when building the tension and unleashing the whirlwind (or is that typhoon?). The guitarwork is quite catchy. Dark, midtempo verses with adapted singing links well with the faster chorus. The verses reminded me a little of, for instance, MANOWAR. Cleaner singing is reserved for the bridge leading to the chorus. As the solo moment is there, so changes the rhythmic assistance. Instrumental talk first, then vocals are added. Afterwards, the power and vitality also increases in the next solo part. This song does rock very much and is certainly one of the highlights on this album. These first few songs were very good, “Spirit Never Dies” (not an EDGUY cover) is more simple and less captivating. There are influences from SAXON and IRON MAIDEN. Everything here, except for the extensive solos, is rather simple, simpler than before. Not that simple is bad, but the filling is not as tasty as before. The repeating of the chorus at the end is rather dull, if I may say so. The guitar start in “Burn Out” leads one to believe the band will again go for a little speed and while it’s not really fast, the music does pound. Powerful riffing, fitting vocals, wild solos… Another highlight, indeed. This song reminded me in a way of HAMMERFALL. “Mind Avulsion” is also among the less attractive songs, in my opinion. Actually, the majority of the songs on this album is very good. Anyway, this 6th song begins with slow, melodic building and rough vocals (similar to REBELLION and GRAVE DIGGER). It’s nice how the band incorporated an Eastern-like melody in the guitar parts and this in the pre-chorus. The chorus itself, although of the slower kind, is also kept simple. A semi-acoustic break is added before the proper solo work is unleashed. Rebuilding afterwards occurs in HAMMERFALL-style and so into the chorus. All in all, an ok song, but nothing more. Time again to bang the head that doesn’t bang: “The Eye Will Control”. This song shows its power from the first second. Or better said, it begins slowly, but it doesn’t take long before the band hits the pedal to the Metal. As you have guessed, it’s another powerful track with passionate vocals. The drums stand out in the bridge, while the chrous is actually the part with which the song started. I’m sorry for the many name-droppings, but when one hears similarities with other bands, why not mention them? In this case it’s ICED EARTH and NOSTRADAMEUS. And like before, solos are part of the structure, too. “The Exodus” begins with a little suspense and builds up slowly. There’s something Thrashy about the music, while the verses have more in common with the German Heavy/Power Metal band REBELLION. Melody again lies in the bridge and the catchy, pounding chorus. The solo part begins in an emotional way, yet progresses towards a more vigorous style. Another highlight, to say the least. This is also the case for “Balls Of Steel”, an ode to Heavy Metal (or Metal in general), indeed. There have been a gazillion of such songs, but numerous bands from various genres. We know already how great the music, etc. is. However, HEAVYLUTION’s version is quite good, I must admit. Musically, at least. No real need to mention the lyrics, as each band sort of tells the same story. It’s a typical Heavy Metal track with firm verses that contrast with a slow, hymnic chorus. About the less attractive or strong songs: “Future Is On Our Side” is the last one. It takes an acoustic start, flip over into slow/midtempo rocking in a solemn way. Vocals are layered in the chorus. To round it off, the band opted for an ’80s feel. Last but certainly not least, the faster, IRON MAIDEN-influenced “Fight For Changes”. Here you’ll find lots of leadwork and solos again, next to the typical verses and chorus. HEAVYLUTION show with “Children Of Hate” that France has another gem to offer. While the band does not break new grounds, the goods they deliver are solid and very much worthy of purchase and adding to your collection and online through WebDesign499. And with this very good album up their sleeves, the band should be able to play outside of France, not in the least in their neighbouring countries. Recommended material!